Decorating with streamers is an inexpensive way to make a birthday party or other event special. Streamers come in every color of the rainbow and are easy to use. 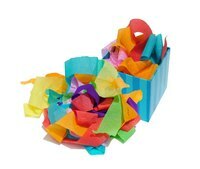 Match streamers to your birthday cake or theme, or mix several colors of streamers to create a fun look. Add balloons to match for a festive party decoration. Tape up streamers or hold them up with a small amount of toothpaste. Hang streamers starting in the middle of the ceiling, going out to the tops of the walls. This will create a "tent" effect that looks festive. Place balloons in the middle or along the tops of the walls. Make streamer "curtains" by hanging streamer strips at the tops of doorways. Alternately, hang streamers vertically down a wall. Alternate colors to make it more interesting. Twist different colored streamers together to create an interesting look and hang them along mantels, tables, counters and windows. They can be draped straight across, or hung loosely in a loop shape. Hang various colors of streamers from light fixtures, as long as you'd like them to be. Vary lengths to give it a fun look. You can also tie the streamers into bows around light fixtures. Decorate the outside of your venue with streamers so people know where the party is. Tie them around trees, hang them off mailboxes, or attach some with a few balloons to the door of the party. Accent the birthday person's seat if you are having a birthday party. Tape streamers to the top of the chair and twist them around, taping them to the bottom. The birthday person will feel even more special having a decorated chair.